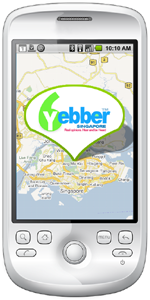 Description: Yebber has released an app for the Android Mobile Platform for Singapore users. 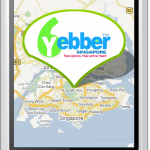 It is a location based service for Singapore that will allow you to find businesses around you (via GPS) and read reviews about them in categories like arts and entertainment, beauty and wellness, shopping, food and beverages, hotels and travels, nightlife, shopping, sports and recreation and practically all the reviews you can find on Yebber Singapore! - Covers wide categories like beauty and wellness, shopping, arts and entertainment, food, restaurants, spa, pets, nightlife, sports and recreation. 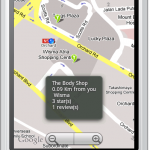 - Use location based service via GPS to find all the above businesses around you, wherever you are in real time. 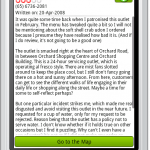 - View surrounding business in list mode or map mode. - Sort Listings by distance, category, number of reviews and ratings. - Read reviews and see what others are saying. 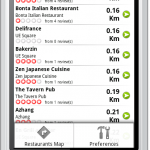 - View your location and the location of the businesses on the map in real time. - Preferences selection allows you to default your favorite selection of categories. 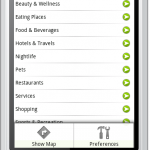 Turn Yebber into your customized shopping guide or spa guide at your fingertips. - Version 1.1 now supports Search function, with the nearest locations appearing as top results. - Android Powered mobile device - Android Operating system 1.5 - GPS or Wireless Networks Turned On - Inorder for GPS to report an accurate position, a clear view of the sky is required; To improve reception, you must also be outdoors and standing away from obstructions like trees and buildings. - Added Search feature to allow search by Business/ Keyword. - Map view update to show nearest businesses by search results. - The application is also featured on the Code Android Singapore site. Read about it here! - For the next 3 consecutive weekends from 20 June to 5th July 2009, HTC is going full force marketing the HTC Magic in Singapore. During this campaign, they will...read more. - Catch Yebber on the 27 and 28th June 2009 at the HTC Magic Roadshow at Suntec City. There will also be a HTC Magic Workshop on the 27th June. Catch all the Details here!